For the past 50 years a select group of scientists has provided advice to the US President, mostly out of the public eye, on issues ranging from the deployment of weapons to the launching of rockets to the moon to the use of stem cells to cure disease. The role of the presidential science advisor came under increasing scrutiny during the administration of George W. Bush, which was highly criticized by many for its use (and some say, misuse) of science. This edited volume includes, for the first time, the reflections of the presidential science advisors from Donald Hornig who served under Lyndon B. Johnson, to John Marburger, who served under George W. Bush, on their roles within both government and the scientific community. It provides an intimate glimpse into the inner workings of the White House, as well as the political realities of providing advice on scientific matters to the President of the United States. The reflections of the advisors are supplemented with critical analysis of the role of the science advisor by several well-recognized science policy practitioners and researchers. This volume will be of interest to science policy and presidential history scholars and students. 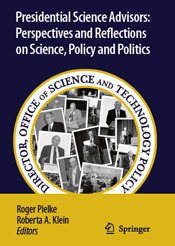 This book offers unique first-hand perspectives of the science advisors to the president, from Lyndon Johnson to George W. Bush. It includes some very unique history (e.g., Edward David’s chapter provides perspective on how President Nixon used the science advisor for political purposes that has been reported nowhere else to our knowledge). The world's response to climate change is deeply flawed. This book is where we begin to get it back on track. The relationship between humans and the earth system that we inhabit is two-way - humans affect the planet and the earth system processes affect us. This symbiosis is characterized by empirical complexities and uncertainties, the most intense of which is the global climate change debate in recent years. These debates are often characterized by a considerable amount of heat, but unfortunately too little light. Environmental studies and science policy expert Roger Pielke, Jr. recommends we should first comprehend why the current approach is failing and then consider better alternatives. While tearing down the venomous politics that have surrounded the debates, Pielke calls for an alternative to the various wishful proposals, typified by the Kyoto Protocol, that hold essentially that ordering climate change to go away will make it go away. The conventional wisdom on how to deal with climate change has failed us, Pielke argues, and it's time to change course. Using nothing more than arithmetic and logical explanation, Pielke provides a comprehensive exploration of the problem and its resolution - such as investing to create a more carbon-efficient economy and cost-efficient carbon-capture technologies. With the goal of advancing the discussion on climate change and contributing to the ongoing national debates in Europe, the United States, Japan, Australia, India, China, and other developed and developing countries, The Climate Fix offers something new to the climate-change discussion - a common sense perspective. 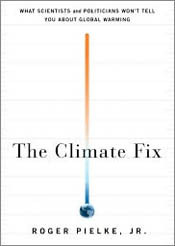 A thought-provoking yet pragmatic discussion of the interaction between science and politics, The Climate Fix proposes a means for digging ourselves out of this climate-change mess that we have created.